LUIGI ARDITI Autograph Musical Quotation. Italian violinist, composer and conductor. 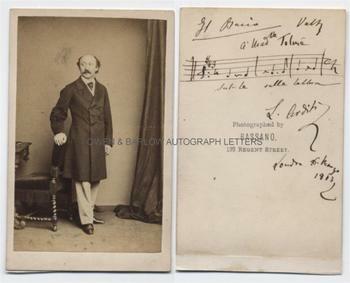 Carte de Visite photograph by Bassano with fine autograph musical quotation of three bars from 'Il Bacio', with vocal score below, inscribed to Madame Tolmé, London 16th May 1863 and signed by Luigi Arditi. The photograph measures approx. 4 x 2.5 inches (including the original photographer's mount) and shows Luigi Arditi full length, dressed in a very dapper frock-coat and with one hand resting n the back of a chair. There is a narrow mounting strip at foot of verso but all else is in fine condition. 'Il Bacio' (The Kiss) is a vocal waltz or song and was one of Arditi's most successful compositions. It remained very popular well into the 20th century and was recorded by Adelina Patti in 1906. Provenance: From a 19th century album composed by the Blyth family. Edward Kell Blyth was a London solicitor who had connections with women's education and employment movements. The family appear to have been related by marriage to the Tolmé family and there was a Thomas Tolmé Blyth, who also practiced as a solicitor.